Until now I used a pliers-type tool, but I gave up many deformations of the eyelet. This product is finished in a form close to the commercially available blue sheet eyelet. This review is about item#37295517. It was easier to use than imagination, it was very easy to use. I will buy it next time as well. This review is about item#37295526. Although I was hoping for opening, pinching and tapping, I was expecting a simple operation, but when I used an iron hammer like other caulking machines the caulking was deformed and failed three times. Since it is a wood (rubber, plastic) hammer in the instructions, I managed to use it somehow. I think that the diameter of the convex type is small, so it seems that it can not be caulked equally even if the compression is strong. That crimp is weak, it is regrettable that the eyelet turns. For bird eye shooting of the bird 's net. Because it is a product of Trusco, it can be used with confidence. It seems that it will not last long if you hit too hard. However, because it is a separate type, it is very good to be able to hit eyelets even in the middle of the net or tent fabric. Because you can remove the male scalpel and make it independent, it is convenient because not only the edge of the sheet but also the center eyelet can be made. This review is about item#37295501. There was a mistake for the first time, but I got used to it and the procedure improved. It's very convenient because you can place eyelets in the center of the sheet. Easily drilled, we could put on eyelets. 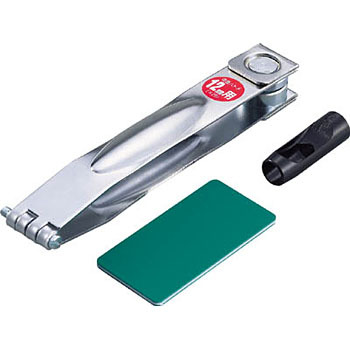 It is necessary to buy rubber hammer at 100 yen shop · · · ·. It is good that you can attach eyelets to the place you like. Firmly, fixed and well suited for use.